Now that the commotion from the transition has died down, I want to share the strategies we used in switching from Word to Pages, along with some of my favorite Pages tips. Look at the Bottom — A classic mistake of the long-time Word user switching to another program is to assume that if you look long enough in the menus and dialogs, you’ll encounter all the important commands available (that’s even more true if you include Word’s Customize Keyboard dialog, which lists a wealth of obscure commands). In Word, you can use the menus and dialogs as training wheels and pretty soon you’ll start using keyboard shortcuts for commands that you choose often. This approach failed dismally in Pages. In Pages, key functions are stuck hither and thither in the user interface and there is no apparent reference that lists them all. Important options appear at the lower left of a Pages document, in a location that is precariously close to the Dock with a full-height Pages window and a horizontal Dock. I’ll explain the three options I use, but note that there is also a checkbox in the Pages General preference pane to show the word count in this lower area; I work with that turned off. The leftmost pop-up menu lets you change your zoom level and how many pages are showing at once. Although Pages does have a Zoom command in the View menu, it won’t let you choose a specific zoom percentage and it lacks the pop-up menu’s One-Up and Two-Up commands that control how many pages appear. I like to work at 100% with two pages showing, but many other Take Control folks prefer a higher zoom level in only a single page, so each time one of us opens the file, the zoom and display layout must be adjusted, which can be done only from this little pop-up menu. The Pages area in the bottom window border turns out to be clickable. Click it, and a “Go to Page” box appears where you can type the page number that you want to move to. Again, you can’t access this navigational control from any normal menu, dialog, or keyboard command. The Scroll To triangles and associated gear menu that appear next are incredibly valuable. You use the gear menu to set what the triangles do. For instance, they can advance you to the next comment in the document, or the next hyperlink. If you want to flip through all the comments in a document quickly, this is where to work. Reveal Hidden Track Changes Toolbar — Another popular chunk of interface real estate for a group of people working on a document is the Track Changes toolbar, which you can bring up by choosing Edit > Track Changes or by clicking the Track Changes button on the main toolbar. The Track Changes button isn’t present on the main toolbar by default, but you can customize the toolbar with View > Customize Toolbar or by Control-clicking it and choosing Customize Toolbar, just like in other Apple applications. To establish a comfortable workflow with the commands available only in the Track Changes toolbar, I had to extend myself outside the confines of Pages because I needed keyboard shortcuts for some of its functions, particularly for accepting changes and for toggling track changes on and off, both functions that I might invoke hundreds of times in a typical day. I finally turned to Keyboard Maestro to create macros that give me keyboard shortcuts for those actions. One warning. It’s not uncommon in a workgroup situation to end up with two copies of a file, each with marked changes. There is, unfortunately, no way in Pages to copy text between files and retain marked changes, or to compare two documents to identify changes between them. Inspect the Inspector — The Inspector is a panel that comes up if you choose View > Inspector (Command-Option-I) or click the Inspector button on the toolbar. Many Pages options are available only from the Inspector, and the Inspector has a bank of tiny buttons at its top, which you click to switch between the different panes of options. I find working with the Inspector easy now, but for the first month it felt slow and cumbersome. Rummage around in the Styles Drawer — Another exciting chunk of Pages real estate is the Styles drawer, which can be opened from the View menu, with a keyboard shortcut, from a button on the Format bar, or with a non-default toolbar button. Within the Styles drawer, it took me a while to realize that an accurate hover over the right of a style name would reveal a tiny triangle pop-up menu and it also took a while to be able to click that minuscule menu reliably on the first click. It all seems easy now, but at first it required persistence. Although we read the manual and searched high and low in Pages, we’ve yet to find a way to configure a paragraph or list style by hand, by selecting the various attributes that we’d like it to include. This is sort of possible when creating (but not editing) a new character style by choosing Create New Character Style from Selection from the None character style’s pop-up menu and then expanding the Include All Character Attributes control. 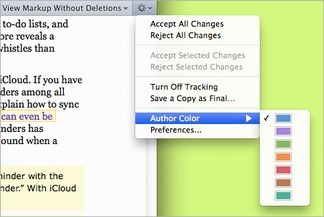 But there is no equivalent to the technique in Word where you choose Format > Style, then click New or Modify and select all the style details via checkboxes and menus. Instead, you must make a paragraph or list look the way you want and then redefine the existing style. Wacky. My Kingdom for an Outline! — A great feature in Word, and one that I am sorry to have left behind, is the Navigation bar, which has been given different names in different versions of Word, all while remaining functionally the same. You open it as a left-hand bar in the Word window, and it shows the outline of your entire document, as long as you’ve used Word’s built-in heading styles (any experienced Word user will always use those built-in styles — they are Word’s crown jewels with their elegant integration with the Table of Contents feature and full, useful Outline view; Pages has a decent Table of Contents feature, but doesn’t begin to compete with Word’s Outline view). In Word’s Navigation bar, you can see the “forest” surrounding the “trees” of what you are reading at all times, and you can even edit the headings right in the Navigation bar. So, if you are in the middle of a chapter and deeply into a set of Heading 3 level topics, and suddenly the manuscript starts alternating between Heading 2 and Heading 4 level topics, you know you are in trouble and can adjust immediately. You can also click any line in the Navigation bar to jump to the corresponding heading. Alas, Pages has no such organizational navigation interface, Also, because Pages has neither a Back command after clicking a link nor any other sensible way to jump back and forth between two sections of a document, we are finding it challenging to get around in longer documents. To simulate the Navigation bar in Pages, some of us have taken to displaying the View > Page Thumbnails bar at the left, expanded as large as possible (drag its right border). It gets large enough that you can read the text in its thumbnails. I like to open it to the table of contents pages, so I can see the “outline” there, and sometimes I open another copy of the manuscript in a separate document window so that I can more fully view the outline or a second portion of a manuscript. Unfortunately, all of these workarounds pale in comparison to Word’s Navigation bar and, frankly, the quality of the link-based user navigation in the Take Control series has decreased slightly because of this, because it is so much more difficult for authors and editors to determine where a possible link might lead. Find the Documentation — Another classic strategy for learning a program deeply is to read the manual or some other form of documentation. I have read the entire Pages manual, and I found it frustrating because, while it does document how Pages is supposed to operate, it doesn’t clarify which features that you might expect in a word processor are not present. (To be fair, very few programs document their shortcomings.) Also, I’ve found some features to be a bit dodgy, most notably section breaks and style modifications, and I can’t figure out if it’s me or a bug in Pages; the manual doesn’t provide examples or describe common use cases. You can find the manual by choosing Pages > Help, but if you plan to refer to it often, I suggest downloading the PDF and storing it somewhere handy. A useful resource for ebook publishers is a short document published by Apple called “ePub Best Practices for Pages,” which you can download from a link in the Apple support note “Creating ePub files with Pages”. The document mentions the handful of styles that you need to use in a Pages document slated for EPUB export and notes the all-important fact that graphics in such a document must be inline, not floating. It took time to learn that the best way to place a figure-sized graphic as inline is to first create a paragraph formatted so that the “Line” is “At Least” a specified line height; the “At Least” setting allows the line height to increase to the height of the graphic (open the Inspector, click the T (for Text) button, click the Text button). Once you have the proper line height format set, press Command while you drag the image file in from the Finder. Another useful resource is the Pages Apple Support Community, which I’ve visited several times to ask questions and to try to help out by answering a few. If you have Pages questions, this is a good place to ask. Work with Great People — Although it was fairly easy to write this article, it was not easy to learn everything that I’ve mentioned in it. It would have been all the harder had I not been part of a small working group of smart and good-spirited people who could commiserate with my woes and sometimes point out options that I’d overlooked. I could write a great deal more about the fine points of Pages and working with change tracking, about how I had to make a macro in order to insert a comment without the timestamp being pre-highlighted (such that when you start typing the timestamp disappears, unless the first key you press is the Right arrow key), about Pages versus Word templates, and more, but I have covered the main high (and low) points for now. If you have a Pages tip to share, please let us know in the comments. Why bother to migrate from Word to Pages? Both apps are limited. At it's core, Word is intended for writing relatively brief business letters and memos. For anything longer and more complex, it's a pain to use. Pages is a simplified page-layout program. It's great for creating a family newsletter. It's not so great for something where content is more important than appearance. Those who want to get away from Word should look into tool that's designed from the ground up to handle either a complex document or a series of shorter documents on similar topics. That's Scrivener. For taking much of the grind out of writing, it beats the socks off anything else on the market. And for office contexts, there's now a Windows version as well as a Mac version, with an iPad/iPhone version in development. And no, I'm not connected to Scrivener's developers. I just use it every day and find it a delight. Here at Take Control, a key aspect of our approach is that our writers write directly into their layout. Because our final product explains complex steps and technical information, the relationship of the words to the final formatting does matter, and being able to see it as we work helps us do a better job faster. IMHO, the good news here is that there are several viable word processors for Mac users to choose among - one size does not have to fit all! Writing about using Macs in Business I was concerned that I would not be able to "eat my own dog food" using non-Apple products to produce a book. Once I found out that iWork Pages could do leading (line spacing by font points) I was hooked that I could do it. Other than some other issues, I'll be using Pages for my next book as well. Wow! Did I need this article. Thanks so much for sharing your experiences with the rest of us. - Full screen is interesting, but there is no way (as far as I can tell) of showing styles - the styles drawer isn't available, and the inspector allows the setting of lots of things (e.g. style for the next para), but not the current style!! Presumably this is a side effect of the minimal update for Lion compatibility. Pages' choice of what to show and not show in Full Screen mode strikes me as a strange combination. They seem to think that a writer might want to be in Full Screen mode in order to focus on writing. But they've ignored the idea that a person might want to be in Full Screen mode with Pages to use all of Pages' features, but without noticing anything else going on on the Mac. Keyboard shortcuts are not limited in Pages, or in any OS X application because you can go to the System Preferences and set (or change) any keyboard shortcut to any menu item in any application to just about anything you want. The challenge here is the items in Pages that are only on the Inspector, with no apparently menubar equivalent. I wonder where you guys stand on Bean 3? Seems like a fine little word processor, but not appropriate for a publishing system that requires change tracking, commenting, and both fully linked PDF and EPUB output. I made the switch long ago, not to Pages, but to LaTeX. LaTeX solves many issues and produces lovely output, but to use it in a multi-user environment you would need git or something, and it is not in any realistic way WYSIWYG. I love LaTeX, but doing layout in LaTeX is a pain. And I don't know what the state of epub from LaTeX is, but i rather suspect it's not up to Pages on that front. Now that my wife has her masters and I do not have to typeset her papers into PDFs (which looked nice enough people actually asked how she generated them), I will probably not use LaTeX at all. If you're interested in using Pages to produce books in PDF form, I'd like to ask a favor... Please go to Apple's Feedback site for Pages and ask them to add an "optical margins" feature, like the one found in Adobe InDesign. Optical margins greatly improve the look of a finished book. It's unfortunate that Pages is such a capable app for producing ebooks, yet because of the lack of that one feature, InDesign remains indispensable. What does "optical margins" do, precisely? Here's a long list of Pages keyboard shortcuts — available as an editable Pages document or PDF. I'm currently switching from AppleWorks to iWork, and I'm very disappointed. Although Pages has some improvements over AppleWorks, in many respects it falls far behind its predecessor. Pages has layout documents, which are very similar to AppleWorks drawings, but Pages can't open them. PDF export is just a bad joke. Styles can not depend on other styles and so on. I think, iWork needs a lot of improvement to shift it to the level of a fine piece of software. I would really love to love the iWork apps, but I just can't. Tonya's article echoes my own experience: Pages is obscure, clunky, and seems more like a sophisticated demo than a battle-tested product. Numbers is similar -- it's cumbersome to actually make a spreadsheet, but there are lots of ways to make a spreadsheet look pretty afterwards. Keynote (after a very painful childhood) is finally quite useable compared to Powerpoint, and is the best of the iWork apps. The recently deceased iWeb was a true abomination. I wish very much that Apple could turn out excellent office programs, as using Microsoft's suite on the Mac is like swimming through mud. I lament the loss of Pagemaker back in its Aldus days! It took me a while to to switch to numbers, but now I find Excel clunky. It is a completely different approach to spreadsheets, but I love the flexibility of working with multiple worksheets on a single layout page. It took getting used to, but it was worth it. I wish it integrated with Pages better, but at least the integration it has is reliable. I've forwarded this on to my wife and several other people. I suggest that a "TCO Switching from Word to Pages" might not be a bad idea. I have a feeling there are a lot of people out there who could find it useful. haha. And, Apple just announced 10.8 Mountain Lion! 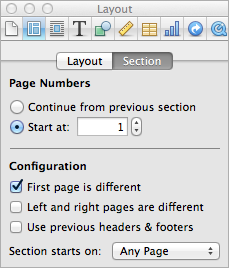 I switched from Word and InDesign to Pages several years ago now and have never looked back. I can finally insert an image into a word processing document and have a fairly firm idea of what will happen to it. Page layout mode lets me have full control over wonky formatting when necessary without all the overhead of InDesign. Pages doesn't try to be either of the other programs, but it turns out to be a very reliable 90% of each. Plenty good enough for me. BUT, I do share Tonya's annoyances. Wouldn't it be nice if there seemed to be a product manager who was a power user (like SJ was with Keynote)? There is lots of room for improvement in many subtle ways.